The summer of love didn’t really seem to make a stop in Australia, in actual fact LSD was a rare commodity throughout the country, with the exception of members of the inner circle’ urban-clique’s and outcasts that congregated in bush communes. And it was probably a good thing too. Weed, beer, sun and surf were a lot more conducive to the Australian lifestyle at the turn of the decade and combined with the undeniable impact of super-groups such as Sabbath and Zeppelin, Oz’s own brand of heavy rock was spawned. From Darlinghurst to Sunbury, the scene was very much alive and kicking. A distinctly Australian brand of rock n’ roll emerged, from The Missing Links to The Coloured balls to Brisbane based punk rock icon’s, the Saints. Oz music has always been very direct, fun & raw by global reputation.The lack of polished edges that music nerds lust for in their music, is rarely ever by design but is more accidental in nature. Little do punters know that often back in the day, producers strived for the highest of high fidelity, but in the southern hemisphere elaborate masterpieces of Phil Spectre-like magnitude were few and far between. In retrospect, albums like Ball Power and I’m Stranded have been revered to no end due to their ‘in the red’ conviction and naivety and finally a new contender has emerged to be champion of the heavy rock category. Like their peers, Buffalo, It was bands like Kahvas Jute that suggested that something a little darker and more progressive was brewing in Sydney’s inner west. 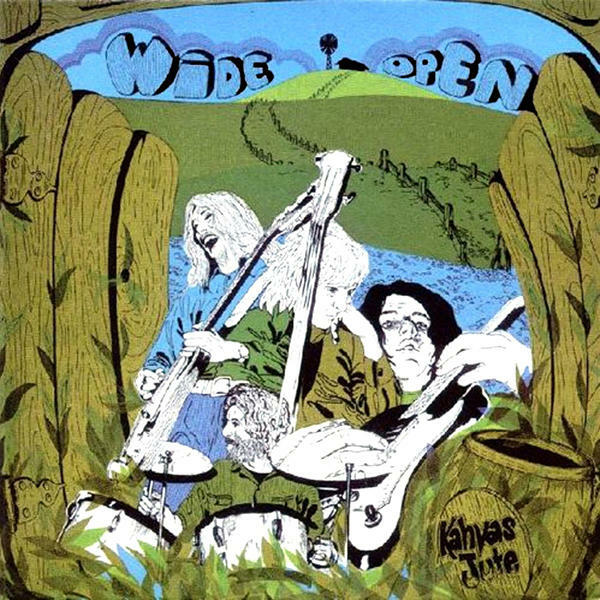 Whilst bands like Spectrum & Daddy Cool reigned supreme and crossed over into a more mainstream market, Jute’s debut ‘Wide Open’ was recorded in 1970 and released only months afterwards to become an underground sensation. To this day, the album remains nothing less than a certified heavy rock masterpiece that has only recently started gaining the recognition it deserves, with the aid of widespread nationwide and more recently, worldwide distro. Production wise, the LP reeks of psychedelic flavoured folk rock and powerful quasi-stoner riffs mixed with Jazz rhythms. Barely out of his teens, front man Dennis Wilson’s powerful reverb- drenched vocals are reminiscent of Cream, steered away from the more seminal quasi-metal styling’s of Deep Purple and other British demi-gods of the era. Bob Daisley - Bass (who went on to play with the likes of Uriah Heep, Ozzie Osbourne and Gary Moore, amongst others, tears up the fret board with double the conviction of Jack Bruce and maintains a frenetic rhythm and a fuzzy tone second to none. Tracks like ‘Odyssey’ and ‘Free’ demonstrate the ease and freedom that Jute possess combining a variety of styles and still keeping to the 3-4 minute rock formula, christened with pop sensibilities. Guitar interplay between on cuts like ‘She’s so hard to shake’ have a church-hall like reverb that transports the listener, to a sort of deep space, intra- stratosphere transcendence; a heady rival for the standardized pentatonic- driven sound that dominated late sixties Oz rock. The stand-out track of this album is no doubt,‘Parade of Fools’, a nine minute wah-wah fuzz fuelled epic with noted lyrical references to Australia’s own counter-revolution, a typical hall mark of protest era music . Wide Open is a must for any aging vinyl-nut who simply doesn’t have the time to frequent record fairs anymore or the current crop of 16 year olds who rarely remove themselves from the business end of their bongs to put anything different into their CD players other than Wolfmother. Or not to mention, the folk who actually lived through the era itself and were lucky enough to see the Jute grace the stage and if that’s one of you reading this now? Then I can’t tell you how envious I am.